Primarily because of their location along the shorelines, it’s estimated that more than 80 percent of the original Great Lakes marshes have been destroyed. 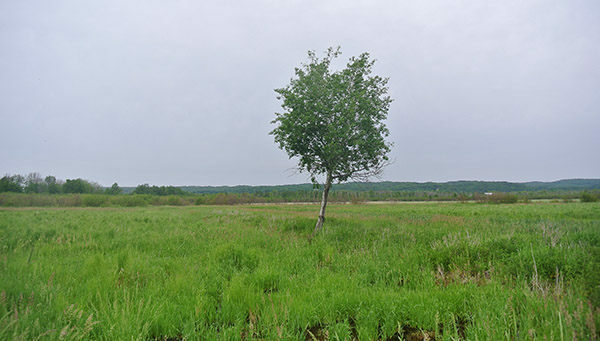 Along Lake Michigan in the Lower Peninsula, about 15 remain today, which is the reason Grand Traverse Regional Land Conservancy put such a high priority on restoring and preserving Arcadia Marsh. Located in Manistee County, the 400-acre marsh borders Arcadia Lake and is fed by Bowens Creek. In the late 1800s, a railroad grade was constructed through the marsh. Then, in the 1950s, the water level was lowered to improve agricultural potential and twice Bowens Creek has been diverted, resulting in a stream that is now very shallow and heavily sedimented. Finally, the marsh was permanently impacted when M-22 was constructed across Arcadia Lake as a quarter-mile causeway perforated only by a narrow bridge. 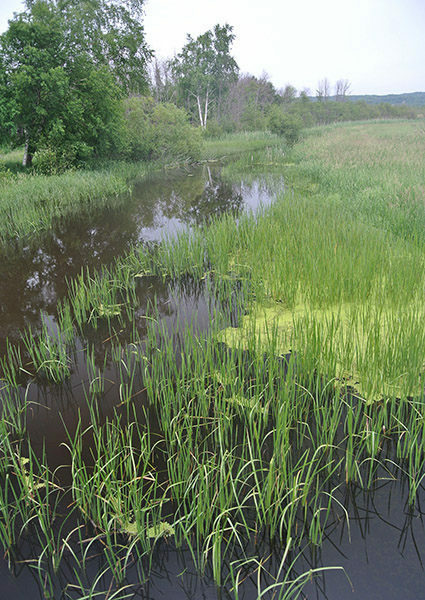 Restoration began in 2010 after GTRLC acquired 155 acres within the marsh. Teaming up with a handful of other conservation groups, work focused on restoring flows within the natural channel of Bowens Creek by plugging previous diversions. A prescribed burn was staged to counter the infestations of invasive species and 6 acres of shallow, open water was created within the marsh to benefit migrating birds and spawning northern pike. Today, Arcadia Marsh Nature Preserve extends over 273 acres on the doorstep of the village of Arcadia. Although the trail system is limited, the preserve has become a popular destination for birders due to the easy viewing of waterfowl and marsh-dependent migrants. As an old two-track, the foot trail offers easy hiking, while M-22 can be used to scope nearly a mile of marsh by pulling off along the side of its elevated causeway. Arcadia Marsh is home to more than 180 species of birds, including 17 State endangered, threatened, or species of special concern. In spring and fall, birders concentrate on migrating waterfowl, cranes (including sand hill cranes), and great blue and green herons. In low-water years the marsh is great for shorebirds and in high-water years it’s one of the easiest places in Michigan to spot American and Least Bittern. Rarities that frequent the marsh include Bewick’s Wren, Black-billed Magpie, Purple Gallinule and Nelson’s Sparrow, while in the winter birders often spot rough-legged hawks and snowy owls. The main trail at Arcadia Marsh is a wide path that extends a half mile into the heart of the preserve. The mile-long hike begins by crossing the mouth of Bowens Creek along a former one-lane vehicle bridge. 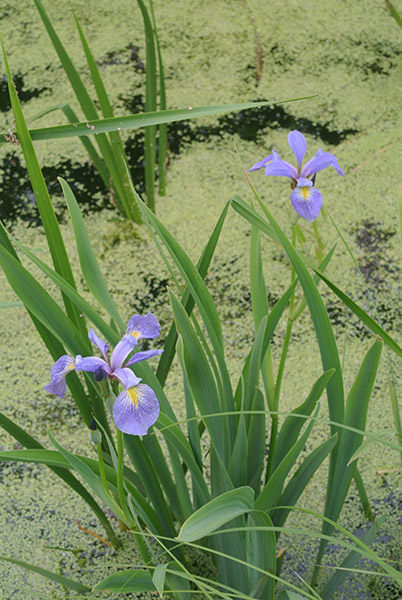 On the other side and for the next half mile there are extensive wetlands all around while skirting the south side of the trail is a channel of open water, painted purple in June by clusters of blue flag irises. Other wildflowers that can be spotted include white water lilies, swamp roses, marsh skullcap, blue vervain and marsh vetchling. Within a half mile you reach a gate across the two-track. Beyond it is a hard-to-follow trail through knee-high grass. This trail is closed from April 15 to July 15 — the reason for the gate — to protect the large number of birds nesting in the marsh. The trail continues east another quarter mile to where the channel empties into Bowens Creek. Other than an information kiosk and parking, there are no other facilities at the Arcadia Marsh trailhead. The nature preserve is open year round but dogs are not allowed from Feb. 1 to Sept. 1 and mountain bikes are banned from the trail. There are no fees for visiting the preserve. Arcadia Nature Preserve is posted along M-22, a half mile south of the town of Arcadia with a trailhead and parking on the east side of the state highway. For more information, contact the Grand Traverse Regional Land Conservancy (231-929-7911; www.gtrlc.org).